Cumbria’s Police and Crime Commissioner Peter McCall joined representatives from Cumbria Constabulary and the Security Industry Authority (SIA) at a conference to help promote ways to help safeguard people, especially the vulnerable, who are out enjoying the night time economy in Cumbria. 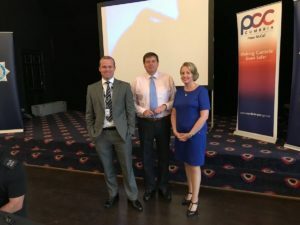 Representatives from the security industry operating in Cumbria, as well as representatives from the Licensing Industry, Community Safety Partnerships and ‘pubwatch’ committees, were invited to attend the conference, which was held at the Hallmark Hotel in Carlisle on 18th September. The programme for the day comprised speakers from the SIA including their Child Protection Officer, DI St Quintin from Cumbria’s Local Safeguarding Children Board, and representative from the licensing/nightclub trade. Presentations included items on tackling child sexual exploitation, young persons diversions away from alcohol, modern slavery, and the launch of the ‘False ID Protocol’. Speaking about the Conference Peter McCall said: “I was really pleased to support this conference because we know that sadly, many people unwittingly put themselves at risk of exploitation, or worse, whilst under the influence of alcohol. This is very much an issue that we must all work together to tackle and today has provided a great platform from which to do this. “Young and less experienced people are particularly vulnerable, and this conference has been a great opportunity to raise issues with those who will see first-hand what goes on in our pubs and clubs, and also highlights some practical steps that can be taken to help reduce the risk of harm. Superintendent Mark Pannone, Cumbria Constabulary, said: “The Constabulary works closely, all year round, with licensees and colleagues from the Security Industry Authority to ensure that people are safe whilst socialising in night time economy areas across the county. “We want people to enjoy going out responsibly as excessive alcohol intake can lead to an individual becoming vulnerable to harm from criminals.